Industry-leading research and development, combined with extensive testing ensures that our HAND & SURFACE WIPES can be effectively used across a whole spectrum of machines and contact surfaces. These WIPES are designed to be used on internal and external machine fascias, steam wands, machine components or any contact surface surrounding a vending machine to ensure a hygienically safe machine and work environment is maintained. FOOD SAFE & NON TAINTING — Our WIPES contain a food safe and non tainting cleaning and disinfectant agent, making these safe to use on food contact components and surfaces such as machine steam wands, whipper bowls, drips trays, machine nozzles, work surfaces etc. INDEPENDANTLY TESTED— Our WIPES have been independently proven by leading UK and European laboratories as being effective against a wide range of bacteria, mycobacterium, viruses and fungi. SAFE TO USE— Can be used on hands as well as contact surfaces eliminating the need for multiple products. 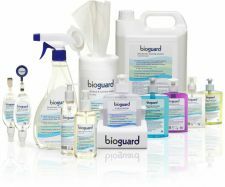 WIDELY USED BY HEALTHCARE PROFESSIONALS— Provide your working environment with the same high levels of hygiene and cleaning as in high risk medical environments. Use daily on water cooler fascias, drip trays, nozzles and surrounding surfaces during route cleaning. Can be used on hands. Open tub lid and feed cloth through the hole in the lid. Pull out and use wipes as necessary.